LeBron Raymone James (born December 30, 1984) is an American professional basketball player currently playing for the Cleveland Cavaliers of the National Basketball Association (NBA). He has started at the small forward and power forward positions. James has won two NBA championships, four NBA Most Valuable Player Awards, two NBA Finals MVP Awards, two Olympic gold medals, an NBA scoring title, and the NBA Rookie of the Year Award. He has also been selected to 11 NBA All-Star teams, 11 All-NBA teams, and six All-Defensive teams, and is the Cavaliers' all-time leading scorer. Off the court, James has accumulated considerable wealth and fame as a result of numerous endorsement deals. His public life has been the subject of much scrutiny and he has been ranked as one of America's most influential and popular athletes. He has been featured in books, documentaries, and television commercials, and has hosted the ESPY Awards and Saturday Night Live. James was born on December 30, 1984 in Akron, Ohio, to a 16-year-old mother, Gloria Marie James, who raised him on her own. Growing up, life was often a struggle for the family, as they moved from apartment to apartment in the seedier neighborhoods of Akron while James' mother struggled to find steady work. Realizing he would be better off with a more stable family environment, Gloria allowed James to move in with the family of Frank Walker, a local youth football coach, who introduced him to basketball when he was nine years old. 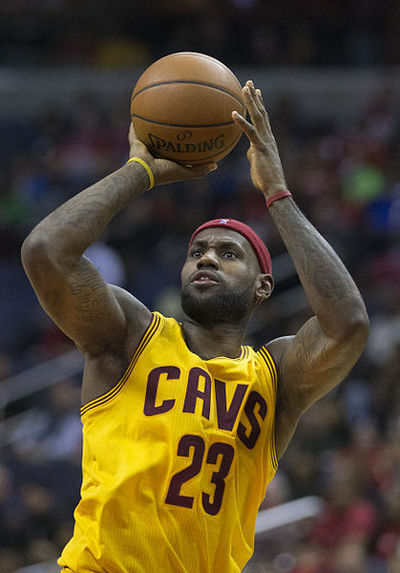 As a youth, James played Amateur Athletic Union (AAU) basketball for the Northeast Ohio Shooting Stars. The team enjoyed success on a local and national level, led by James and his friends Sian Cotton, Dru Joyce III, and Willie McGee. Inseparable, they dubbed themselves the "Fab Four" and promised each other they would attend high school together. In a move that stirred local controversy, they chose to attend St. Vincent–St. Mary High School, a largely white private Catholic school. In his freshman year, James averaged 21 points and 6 rebounds per game for St. Vincent-St. Mary's varsity team. The Fighting Irish finished the year 27–0, winning the Division III state title. In his sophomore year, James averaged 25.2 points and 7.2 rebounds per game with 5.8 assists and 3.8 steals per game. For some home games during the season, St. Vincent-St. Mary played at the University of Akron's 5,492-seat Rhodes Arena to satisfy ticket demand from alumni, fans, and college and NBA scouts who wanted to see James play. The Fighting Irish finished the season 26–1 and repeated as state champions. For his outstanding play, James was named Ohio's Mr. Basketball and was selected to the USA Today All-USA First Team, becoming the first sophomore to do either. Prior to the start of James' junior year, he appeared in SLAM Magazine and was lauded as possibly "the best high school basketball player in America right now" by writer Ryan Jones. During the season, he appeared on the cover of Sports Illustrated, becoming the first underclass high school basketball player to do so. With averages of 29 points, 8.3 rebounds, 5.7 assists, and 3.3 steals per game, he was again named Ohio's Mr. Basketball and selected to the USA Today All-USA First Team, and became the first junior to win the boys' basketball Gatorade National Player of the Year Award. St. Vincent-St. Mary finished the year with a 23–4 record, ending their season with a loss in the Division II championship game. Following the loss, James seriously considered declaring for the 2002 NBA draft, unsuccessfully petitioning for an adjustment to the NBA's draft eligibility rules which required prospective players to have at least graduated from high school. During this time, James used marijuana to help cope with stress resulting from the constant media attention he was receiving. During his senior year, James and the Fighting Irish traveled around the country to play a number of nationally ranked teams, including a game against Oak Hill Academy that was nationally televised on ESPN2. Time Warner Cable, looking to capitalize on James' popularity, offered St. Vincent-St. Mary's games to subscribers on a pay-per-view basis throughout the season. For the year, James averaged 31.6 points, 9.6 rebounds, 4.6 assists, and 3.4 steals per game, was named Ohio's Mr. Basketball and USA Today All-USA First Team for an unprecedented third consecutive year, and was named Gatorade National Player of the Year for the second consecutive year. He participated in three year-end high school basketball all-star games—the EA Sports Roundball Classic, the Jordan Capital Classic, and the 2003 McDonald's All-American Game—losing his NCAA eligibility and making it official he would enter the 2003 NBA draft. According to Ryan Jones, James left high school as "the most hyped basketball player ever". Standing at six feet, eight inches tall and weighing 250 pounds, James has been ranked as one of the best physical specimens in sports due to his combination of agility, endurance, speed, and strength. He has started at small forward and power forward, but can also play and guard the other three positions. With career averages of 27.5 points, 7.2 rebounds, 6.9 assists, and 1.7 steals per game, he is considered one of the most versatile players in the NBA, and has been compared to Hall of Famers Oscar Robertson, Magic Johnson, and Michael Jordan. James has earned All-NBA honors every season since his sophomore year, All-Defensive honors every season from 2009 to 2014, and was named Rookie of the Year in his debut season. With four MVP awards, he is part of a select group of players who have won the award four times, including Kareem Abdul-Jabbar, Jordan, Wilt Chamberlain, and Bill Russell; only he and Russell have won four MVP awards in a five-year span. While James has never won the Defensive Player of the Year Award, he has finished second in the voting twice and lists it as one of his main goals. Since 2011, he has been ranked the best player in the NBA by ESPN and Sports Illustrated. James proposed to Savannah Brinson, his high school sweetheart, on December 31, 2011 at a party celebrating New Year's Eve and his 27th birthday. The two were married on September 14, 2013 in San Diego. Together they have two sons, LeBron James, Jr. (nicknamed "Bronny") and Bryce Maximus James, and one daughter, Zhuri James. During his tenure with the Heat, James resided in Coconut Grove, an affluent Miami neighborhood, where he bought a three-story mansion overlooking Biscayne Bay for $9 million. He later listed the Miami property for $17 million after deciding to rejoin the Cavaliers.